A dirt road runs a couple miles up Surprise Canyon, but is closed at Chris Wicht's Camp (also known as Novack Camp). From there it is necessary to hike up the canyon. Much of the canyon is clogged with vegetation making hiking difficult. 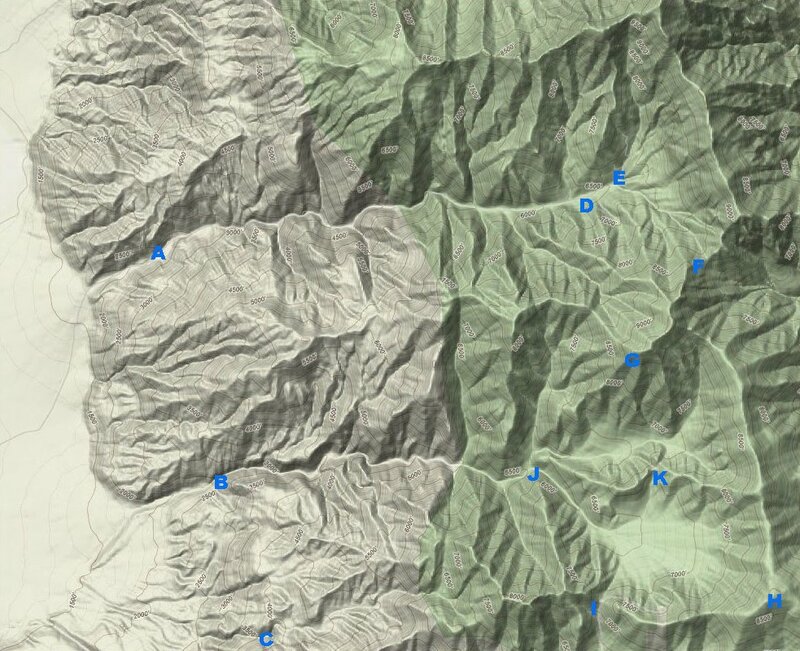 Panamint City is approximately five and a half miles up the canyon from the trailhead. From there is is possible to hike in several directions. One major destination is Sentinel Peak. However, it is also possible to climb Sentinel Peak from Pleasant or Happy Canyon. Although a road enters the mouth of Happy Canyon and it is possible to hike up the canyon from the bottom, the route is clogged with vegetation. A better way to access Happy Canyon is to drive up Pleasant Canyon and park at the saddle between Happy and Pleasant. It is said that over 2000 people lived in Panamint City during the late 1800's. The first three pictures show some of the ruins from this time period. The fourth picture shows the famous stack which stands sixty feet high and was built in the late 1800s. The last three pictures show various structures in and around Panamint City. The mine tunnel shown in the last picture goes straight into the mountain about one-third of a mile. Lots of good information about Panamint City is available at PanamintCharlie.com. Limekiln Springs is about a mile up from the falls. Another spring, called Brewery Springs, is another mile or so up the road. This cabin, located on the ridge between Surprise Canyon and Hall Canyon, is what, I believe is sometimes referred to as Shotgun Mary's. Hall Canyon is the canyon to the north of Panamint Canyon. Some people call the cabin at Thompson Camp by this name. Thompson Camp is less than a mile up the canyon from Panamint City.